The next time everyday pressures build up to the point where you feel like lashing out — STOP! Try any of these simple alternatives. You’ll feel better… and so will your child. Take a deep breath… and another. Then remember you are the adult. Press your lips together and count to 10… or better yet, to 20. Put your child in a time-out chair (remember this rule: one time-out minute for each year of age). Put yourself in a time-out chair. Think about why you are angry: is it your child, or is your child simply a convenient target for your anger? Call for prevention information: Wisconsin residents call Prevent Child Abuse Wisconsin: (920) 996-2210. Empathy allows us to connect to and understand people, to act and react to life based not only on fact, but with an understanding of the human elements involved. It is a common trait among the most giving members of our society, from social workers and teachers, to worldwide humanitarians. Empathy is an incredibly valuable skill, but it is also, like any other skill, one that has to be learned. You; the parent, the sibling, the grandparent, the teacher, the caregiver, the family support worker, or just the adult who cares, teach children empathy every day, whether you realize it or not. Take a moment to share a warm memory you have of a child in your life making that connection to empathy, whether it is with a hug for a friend who is crying, or laughing out loud, just because you are. Why? Because tomorrow is Valentine’s Day and there is no greater expression of love we can give the children in our lives than the ability to love and understand others through the empathy they learn from us. 8 Ways to Keep Screen Time at Bay: For Children, and You! Instead of Saturday morning cartoons, try Saturday morning books. Get new books from the library and place them out where your child(ren) can find them easily before you go to bed Friday night. Make bedrooms a screen-free zone. Your child(ren) and you will sleep better, and it will keep TV to family rooms where if you do have some screen time, you are more likely to do it together. Choose ONE time a week to watch TV or a movie as a family. That way screen time becomes a rare, but social experience. Turn the TV off for the rest of the week. Make car rides (both long and short) about music and games, not staring at the TV screen. Find a few ideas for car ride games here for school-age children, or here for babies and toddlers. Hide your screens! Tuck TVs behind doors, slide laptops and tablets out of sight. The more it takes to get to them, the less they’ll be used! Count how many screens you have currently. How can you make that a smaller number? Do you really need all of the ones that you have? Turn the TV off for meals and snacks. That way the focus can be on the food and more importantly, the conversation. Young children learn social emotional cues and reach important developmental benchmarks through talking and spending time with you, their parents or caregiver. If your child goes to an early care and education or school-age care program, ask about their policies and practices regarding screen time. Take a look to see if TVs, computers, tablets, or video games are present. If they are, be sure you know how they are used and that teachers are aware of your expectations for limiting screen time for your child(ren). These are only a few ideas– share yours! At Parklawn Family Resource Center, staff knows that a family’s needs don’t arise just between the hours of 8am and 5pm and not just when parenting classes are scheduled. And this is where responsive services come into play. Welcoming walk-ins and staffing a warm-line, Parklawn hears the needs of families and moves to meet them. For example, Parklawn Family Resource Center recently re-evaluated their programming schedule when families brought concerns about conflicts with Head Start scheduling to light. Families described Head Start time as time for their child’s early learning and the family resource center as their place for family. And so, Parklawn sprang into action, modifying their schedule because why should a family faced with many difficult decisions have to choose between early learning and family support. Andrea Alfke, parent educator at Parklawn, further describes the center’s services. She acknowledges the stressors that families may be dealing with in that it can be very difficult to leave the day behind and learn. This is why she approaches her work in a way that intentionally combines education with support. She ensures that families have the venue to talk about what needs to be talked about so that they can then be ready to absorb more information. Andrea reaffirms the responsive role of the family resource center saying, “We hold mom and mom learns how to hold baby”. Learn more about Family Resource Centers on the SFTA website. At a recent membership meeting, Supporting Families Together Association (SFTA) hosted a panel that included Heidi Wegleitner & Erica Lopez, attorneys with Legal Action of Wisconsin, Leslie McAllister from the Department of Children and Families and Lilly Irvin-Vitela and Romilia Schlueter of SFTA with Jill Hoiting of SFTA moderating. Below are a series of questions that were posed in writing, but were not able to be read for the panel before the session ended. See the responses here! Question: How can we support families that are facing credit issues or have bad credit due to multiple evictions? Heidi Wegleitner: Help families obtain income to support a housing payment and utilities going forward. If they have enough income to gradually pay off debt owed to a former landlord, they could do that. Of course, they should keep records of payments made and avoid paying in cash. If they dispute the debt and it shows up on their credit report, they have the right to dispute it and the credit reporting agency must report it as disputed. If the debt is disputed, they should not make payments on the debt. If the existence of the debt is not disputed, but the amount is, they could make payments to pay off the amount they believe is owed, making it clear that they only intend to pay off the amount they agree is owed. They should pay off more recent debts first because the old ones may be past or close to the statute of limitations and the time at which it will be taken off the credit report. If they make a payment on an old debt, they reaffirm the debt and the statute of limitations defense is lost. Debts to the government, especially public housing agencies, should be a priority because it is a barrier to eligibility for low income housing programs. Utility debts should also be prioritized. I think it is ridiculous that folks are denied access to housing related to negative credit history that is unrelated to housing, but it happens all the time. If these are medical related debts, that should be pointed out and could be the basis for a reasonable accommodation request to make an exception to their screening policy forming the basis of denial if the negative credit history if it was related to a disability. Hospitals also have “charity care” programs available for folks to apply for forgiveness of debt that could be explored. Question: What resources are out there to help families who make too much for BadgerCare, but are not offered insurance through their work? Erica Lopez: HIRSP, the Health Insurance Risk Sharing Plan is an option. The Health Insurance Risk-Sharing Plan (HIRSP) offers health insurance to Wisconsin residents who either are unable to find adequate health insurance coverage in the private market due to their medical conditions or who have lost their employer-sponsored group health insurance. Applicants are required to meet HIRSP eligibility criteria to qualify. To determine eligibility and get more information about this program, click here. Jill Hoiting: Wisconsin currently has over 30 Federally Qualified Health Centers. FQHCs must be located in a federally designated Medically Underserved Area or serve a federally designated Medically Underserved Population. Additionally, they must offer a sliding fee scale and provide services regardless of ability to pay. To find a health center in your neck of the woods, click here. Additionally, as mentioned above hospitals and even some clinics have charity care programs that can be applied to for specific services or to relieve past medical debt. Other assistance options do exist, such as prescription assistance for low-income and often uninsured individuals and families. The Partnership for Prescription Assistanceoffers information on which pharmaceutical companies offer assistance. Often times health centers can also help to link families with these assistance programs. Question: How do families access resources that are traditionally offered through an FRC, if they do not have an FRC in their county? Lilly Irvin-Vitela: Sometimes these resources are offered through health and human service departments, school districts, community centers, and faith-based organizations/churches. What’s unique about FRCs is that a whole continuum of services is available that are prevention focused rather than treatment or intervention focused. Jill Hoiting: Additionally, your local 211 can be a great way for families to access resources in their community. To find your local call center visit: 211 Call Center Search. Question: What quality assurances are in place to make sure that counties are accountable to families and that power issues are not dysfunctional? Heidi Wegleitner: Good question. We are fortunate to have an Ombudsman for Human Services here in Dane County who helps individual families work through problems related to human services. I think this is a very valuable position. If it gets bad enough, the county could be held accountable through a lawsuit, which is what happened in Milwaukee County a few years ago. Leslie also spoke to the importance of sharing micro-problems to help craft macro-solutions. Question: What rights do families who are currently residing in shelters have? Heidi Wegleitner: Shelters should have a grievance process available to families who have complaints with the shelter. This may be related to improper denial of shelter or other issues related to the condition of the shelter or treatment of staff. The rules of the shelter, admissions policies and time limits will vary depending on the shelter. What can be problematic about shelter grievance processes, as we’ve noticed here in Madison, is that the entity processing the grievance is the shelter itself which is obviously biased and lacks the impartiality required to make a fair decision. We have proposed a third party grievance process here in Madison. Problems could also be brought to the attention of the agencies funding the shelters, which have the purse strings necessary to incentivize improved performance. Additionally, homeless kids have rights under McKinney-Vento. Click here for more information from DPI’s webpage describing those rights. Question: How do we address the diversity of primary languages that families bring to the table when dealing with financial and legal issues? Heidi Wegleitner: We use Language Line to talk to folks with different languages over the telephone. We also hire interpreters when necessary. Usually, in a pinch and for more informal stuff, the family will have a friend or other family member that they may be able to bring with them to help them communicate and understand what is going on. This is not ideal, and is very problematic with issues related to family law and child protection, but for some basic communication it can help. Of course, it should be someone they trust. Erica Lopez: Also, make sure that the person translating is not a minor child. The notices issued by public benefits are issued in the language that the families often speak. With some, but not all immigrant families, there are often literacy issues that are more of a barrier than even language at times. Even persons that understand Spanish may not understand the specific language in the notices. This is why it’s important to get copied on any correspondence with the family if there are language barriers. Question: How do we know if a family is or isn’t receiving every benefit they are entitled to? Erica Lopez: Education about public benefits is key here. There are materials online for every public benefit that help you understand some of the basic eligibility criteria. There are handbooks and publications online that provide an overwhelming amount of information about public benefits. You may have to designate one person on staff to print out materials for the rest of the staff. The information is widely available on websites such as: Forward Health by the Department of Health Services and the Department of Children and Families. The benefits that help families include FoodShare, Wisconsin Shares, Caretaker Supplement, Emergency Assistance, Job Access Loan, W-2 and Emergency Payment, BadgerCare Plus, Medical Assistance. Each of these benefits has a website that provides the information you need – a simple Google search will yield the right website. It’s just a matter of culling through the website. Another option is to contact your local legal services agency for training on public benefits. Leslie McAllister: The ACCESS website and the Covering Kids & Families Toolbox are both great resources to help find out if families are receiving the public benefits they are eligible for. While I absolutely agree that all folks that work with families should be well-versed about public benefits, I think it is also critical that one a trusting relationship is developed, families are asked directly about which programs they’ve applied for and what programs they participate in. In the spirit of empowering families, I’d love to see staff be able to “coach” families about what programs they might be eligible for and how to most appropriately advocate for themselves within those systems. For example, if the family believes they are eligible for a particular program but were determined ineligible, the staff could help them by better understanding the eligibility rules and could help them “build their case” to be reevaluated for eligibility. 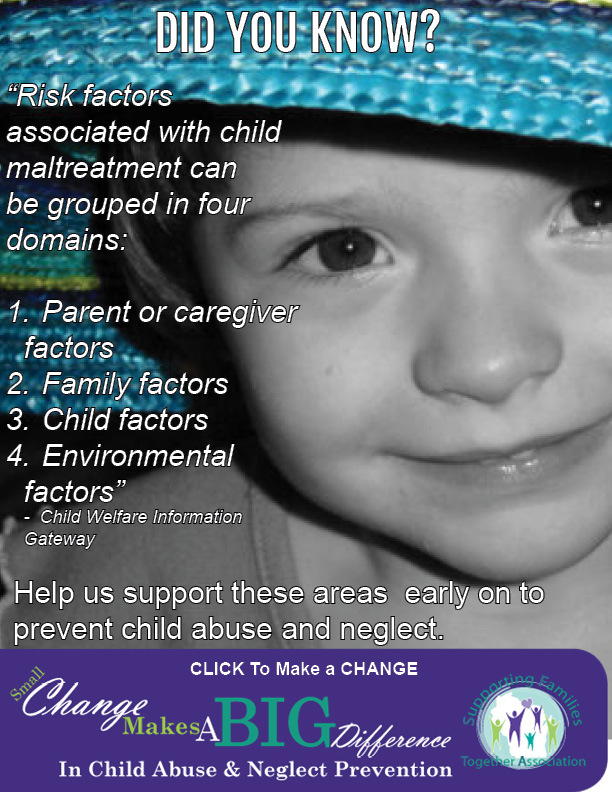 Question: How is the current economy impacting children, families and communities, as it relates to abuse and neglect? How is it impacting child care? Lilly Irvin-Vitela: As we know from the research around Strengthening Families when parents have increased stress, there is increased risk for child maltreatment. This is true for financial stress as well. During periods of economic down turn and increased unemployment, risk factors for child maltreatment increase. For example, prior to 2007 the rate of abusive head trauma (shaken baby syndrome) was 8.9 per year per 100,000 children. Currently, it is 14.7 per 100,000. For more information read Berger, Fromkin, Stutz, Makoroff & Scribano’s article Abusive Head Trauma During a Time of Increased Unemployment: A Multicenter Analysis. A down economy is a call to action to find ways to better support people experiencing economic stress. As for child care, in the first few years of the recession, there was a significant drop-off in regulated child care programs and anecdotal evidence of an increased use in family friend and neighbor care. Leslie McAllister: There are some great articles, including some by UW-Madison researchers that discuss the connection between poverty and child maltreatment, particularly neglect. Here’s the link:Poverty and Economic Conditions. Another good brief about what the latest data tells us about poverty is Two Generations in Poverty by Child Trends.